Portsmouth boxer Ebonie Jones says she is inspired by the fighting style of former heavyweight champion Mike Tyson. Jones, who stands 5ft 1ins, beat Kazakhstan's Mahabat Abdimanapova in the 51kg final at the recent Nations Cup in Serbia to continue her rise in the world of boxing. "I love watching him. 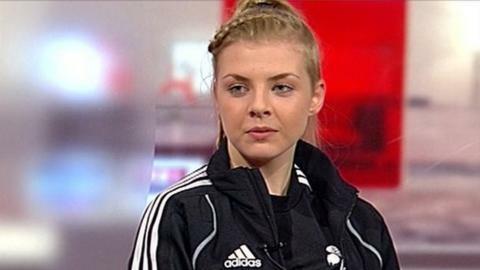 It shows you can be short and be the best in the world," the 16-year-old told BBC Radio Solent. "His opponents were all taller than him, just like mine are." At 5ft 10ins, Tyson was short by heavyweight standards, with contemporaries like Frank Bruno (6ft 3ins), Trevor Berbick (6ft 2ins) and Michael Spinks (6ft 3ins) all several inches taller, forcing him to adopt his trademark style of fighting at close range. Jones is still learning her trade, but a gold medal in her first tournament since moving from junior to youth level further underlined her potential, with European titles and three ABA national titles already on her CV. "It's weird going from being at the top of the category as a junior and then in the new year being at the bottom," said Jones. "Because I'm 16, I could be boxing girls who are two years older, like the girl in the final. Although there was a difference in age there was also a difference in height which I'm used to. "Most of the time my opponents are taller than me so they've got the reach and I like to keep the pressure on and fight on the inside." "I performed pretty well, but I didn't really feel much different." Jones's father Brian is a huge boxing fan and said his love of the sport, and ring stars like Tyson and Britain's former light-welterweight and welterweight world champion Ricky Hatton, had rubbed off on his daughter. "I love boxing and we would watch a lot of it around the house. Not just Tyson, but lots of boxers and Ebonie is very good at studying them and seeing what works," he told BBC Sport. "She's well used to fighting girls much bigger than her. At the Euros, when she stood on top of the podium to get her gold medal she was just about the same height as the Polish girl she'd beaten!" Jones is set to box at the World Championships in Taiwan in May, before turning her attention to the European Championships in August and - if the competition is confirmed - the Youth Commonwealth Games in Samoa in September. She is also studying for three A-levels and has to live a disciplined lifestyle with training and nutrition increasingly important as she climbs the boxing ladder. "I have got to sacrifice a lot, but I think it's all worth it. My aim is to make the Olympics one day and get gold," she added. "At 16, not many people get to travel around the world doing something they love."